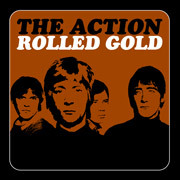 THE ACTION - "Rolled Gold"
The Action was a short lived English pop band that existed from 1966- 68. Even though the band officially released five singles and their number one fan was famed record producer George Martin, The Action never really got off the ground. Which is a REAL shame because a good most of the CD's tunes are very good, if not somewhat outstanding. Some of these 'never released' collections are actually pretty boring. But, Rolled Gold is an exception. This fourteen track compilation is quite worthy with it's catchy lyrics, creative guitar playing, and some nice surprises. Like, for example, the clever arrangement of "Strange Roads". Dig the entire disc, but the true highlights are easy to spot like "Something To Say", "Brain", the energetic "Look At The View", "Climbing Up The Wall", "I'm A Stranger", the mod gem "Little Boy" and the should've been a hit "Follow Me". It's WELL worth it. Should appeal to fans of vintage Who, Stones, Zombies, Troggs, and the modern day psych popsters Beachwood Sparks.